When many of us see the anguish we have caused an "enemy" we feel not compassion or regret but annoyance. The reaction is "why are you showing me that? Don't you know it is their (the other's) own behavior that made us hurt them? It is their own fault." That we react this way to the horrors we are capable of causing, is a sure sign that those same actions have dehumanized us. In making the announcement of the winning image, Santiago Lyon, vice president and director of photography for The Associated Press, said "a picture should engage the head, the heart and the stomach....This picture for us on the jury reached us on these three levels." Winning the prize with such a photo brought mixed emotions to Hansen, "I was very happy on one level, of course....And, I was also very sad. It was a very sad situation." -- On 15 November 2012, five days before Hansen's photo was taken, another photograph showed up on the front page of the Washington Post. This image showed Jihad Masharawi, a Palestinian journalist resident in Gaza, in deep anguish as he holds the body of his dead 11 month-old son killed when an Israeli bomb landed on their home. Mary Ann Golon, the Post's director of Photography, explained, "when we looked at the selection that night of Middle East photos from the wire services, this photo got everyone in the gut...it went straight to the heart, this sobbing man who just lost his baby son." It should also have spoken to the head, but for some of the Post's readers, that was not the case. The fact that this image found its way onto the front page of the Washington Pos t meant that it was noticed by many more Americans than the Hansen photo. As a consequence, Zionist readers and organizations wrote to the paper's ombudsman and the editors, "protesting the photo as biased." What they meant was that the Post should have somehow made it clear that the Palestinians had "made the Israelis do this" by periodically launching their small rockets into southern Israel. In other words, they wanted to know why the paper had not "balanced the photo of the grieving [Palestinian] father with one of Israelis who had lost a loved one from Gaza rocket fire." The answer was that, as of that date, there were no such victims in this round of fighting. 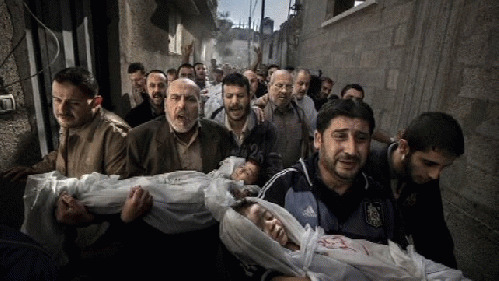 "No Israeli had been killed by Gaza rocket fire since Oct. 29, 2011, more than a year earlier." -- As soon as the the Washington Post image appeared, the Israeli military started posting images of wounded Israelis, particularly children. One emotionally moving photo of a wounded baby also ended up on Prime Minister Netanyahu's official Twitter account.